With the nights drawing rapidly in, and more time being spent in front of the telly, it’s the perfect time of year for a huge upgrade to your home cinema. And what better upgrade than an amazing Philips OLED+ 903 TV, which not only offers incredible OLED 4K tech, but also packs in a Bowers & Wilkins sound system that produces full and rich audio. It’s everything you need for a total living room experience update, worth £3,499, and we have one to give away and make your Christmas extra special, courtesy of Philips. There’s so much clever tech that combines to make Philips’ latest TVs stand out from the crowd. The second-generation P5 image processor really makes the most of the Ultra HD resolution and high dynamic range (HDR) support. Everything looks incredibly clean and crisp, regardless of whether you’re watching native 4K content or upscaled HD video. It also makes motion smoother, so that sports and action don’t look smeared across the screen. Detail is preserved, so you can see more of what’s going on in the game or movie. HDR video looks absolutely astonishing on the OLED screen, with dark areas full of texture, and bright parts jumping out, making everything look more striking and realistic than ever. The dynamic range is second to none. The best part is that you don’t need HDR footage to take advantage of the full range that the OLED screen is capable of. The built-in Perfect Natural Reality extends the dynamic range of SDR images to look more like HDR, and it works like magic: movies and TV look so much more dramatic and lifelike. And it’s all backed up with Philips’ unique Ambilight tech, which gently lights the wall behind the TV with the colours on-screen, creating a fantastic sense of ambiance. The Bowers & Wilkins sound system is the icing on the cake, adding full sound that’s way beyond what you get from other TVs, thanks to a 2.1 setup that balances high-detail drivers with a bass-strong woofer. 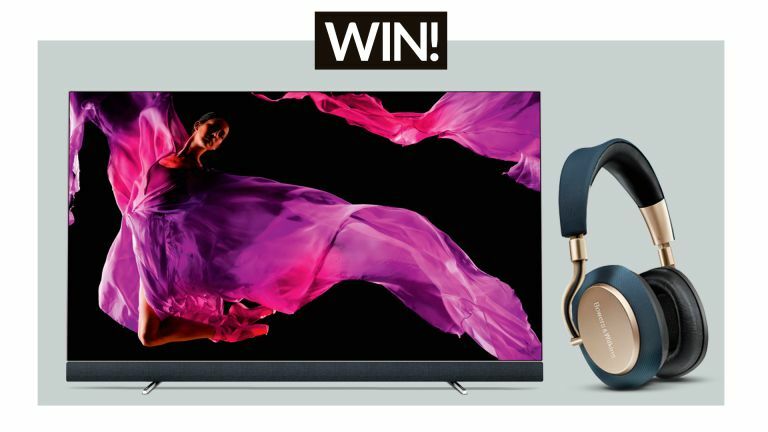 That’s not all we have, though: not content with just making the Philips TV sound brilliant, Bowers & Wilkins is providing five pairs of B&W PX headphones for five lucky runners-up, worth £329 each! These headphones are so good, they won our T3 Award for Best Over-Ear Headphones this year, and are an instant upgrade for listening wired or wirelessly. They’re beautiful headphones, with fantastic build quality, and a comfortable design you can wear for hours. They’re smart too, and include intelligent noise reduction, which cuts outside sounds so you can hear your music more clearly, but that can let in things like traffic subtly if you choose, so you’re aware of what’s around you. They also stop playing automatically when you take them off, saving battery. For more information about the Philips OLED+ 903 TV, visit philips.co.uk. To find out more about the Bowers & Wilkins PX headphones, visit bowers-wilkins.co.uk. You can enter the competition right here. (UK time). Open to UK residents aged 18 years and over. There will be one winner, entitled to one Philips OLED+ 903 65-inch TV, and five runners-up entitled to one Bowers & Wilkins PX each. The prize is non-transferable and non-refundable. There is no cash alternative.